John Schlesinger's classic British working class relationship drama comes to blu-ray. 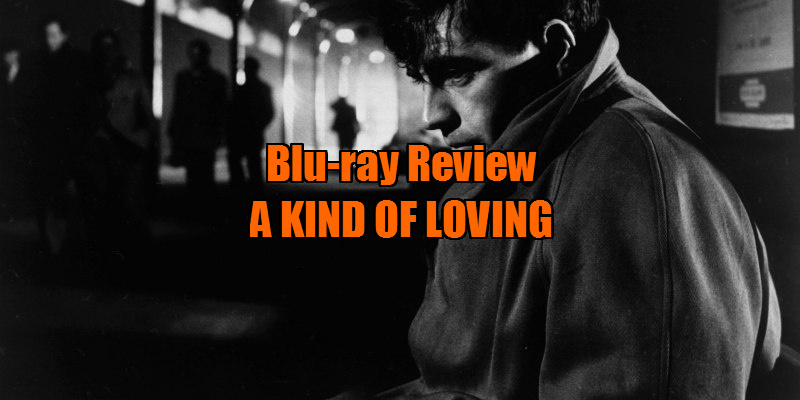 John Schlesinger's 1962 adaptation of Stan Barstow's novel A Kind of Loving gives a glorious Lancashire accented voice to existential working class male angst through the vessel of its protagonist, Alan Bates' Victor Brown. Culturally speaking, decades rarely begin in their first year. The 1960s as we think of it today, a time of rapid paced cultural and social revolution, didn't really begin until as late as 1963. A mere year earlier, London was still rebuilding from the blitz, yet to swing, The Beatles had left the drabness of Liverpool for the bright lights of Hamburg, and James Bond was yet to deliver the first great working class British screen hero. Young people were still expected to follow the same life path as their parents' and grandparents' generations - get a secure job, find a mate, get married, add your name to the council housing list, have a child, a second child, maybe more if you can afford it. Of course, plenty still follow that course today, and for many it leads to a perfectly contented life, but some just aren't cut out for it. John Schlesinger's 1962 adaptation of Stan Barstow's novel A Kind of Loving gives a glorious Lancashire accented voice to existential working class male angst through the vessel of its protagonist, Alan Bates' Victor Brown. When we meet him first he's taken the first step on that prescribed life path, working successfully as a draughtsman in a busy Manchester company, though still living with his parents. Now it's time for him to find a suitable mate, and he doesn't have to look further than the pretty blond typist who works downstairs at the firm, June Ritchie's Ingrid. The two begin dating, and while Ingrid falls head over heels, Victor discovers his attraction doesn't extend too far beyond the physical. "Sometimes I really fancy her, and the next day I can hardly stand the sight of her," he confesses to his immature male co-workers. When Ingrid becomes pregnant, the two are forced to conform to society's wishes and become a married couple (abortion wouldn't become legal in the UK until 1967). Victor finds himself living not only with a wife he doesn't really love, but with her disapproving mother (Thora Hird). Shot in stark black and white in the smog shrouded urban expanse of the Greater Manchester area, Schlesinger's kitchen sink drama often resembles a film noir, and in some ways it is, albeit one in which the central male figure is both the put upon protagonist and the alluring femme fatale. Victor gets himself into a mess of his own accord by sleeping with Ingrid without contraception, yet crucially the conservative society of the time plays its part in his downfall, as the young man is too embarrassed to purchase 'something for the weekend' from the no doubt disapproving old biddy behind the counter at his local chemist, the only place condoms could be purchased at the time. Victor makes it difficult for us to empathise with him, particularly in his cruel treatment of Ingrid's mother, who may be the last person any young lad would want to share a house with, but is good enough to let him live in her home. At times he's a misogynistic brute, and though the movie ends with some sort of reconciliation between himself and Ingrid, it's easy to imagine the relationship being blighted with domestic violence at some point in their future. Yet we feel his pain of being crushed under the weight of societal expectations of conformity. If only he'd waited another year; John and Paul may have eased his suffering. An interview with critic and broadcaster Stuart Maconie, a 1988 interview with Schlesinger, a featurette on the British New Wave, and Schlesinger's Oscar winning short film Terminus. A Kind of Loving is released on Blu-Ray, DVD and EST on August 1st from Studiocanal.